When you plop an undeveloped mountain area into the middle of urban sprawl, you get some pretty fantastic views and a perfect place to get away from it all. In Los Angeles, Griffith Park includes a 53-mile network of hiking trails, fire roads, and bridle paths. It's no wonder hiking is one of the most popular things to do in LA's biggest city park. Before you go, you should know that all Griffith Park hiking trails close at dusk. Open fires and smoking are not allowed anywhere in the park. Most of the hiking trails in the park are dog-friendly (except for the old Bird Sanctuary), but they must be on a leash except in the designated dog park on North Zoo Drive at the north end of the soccer field. GPS and mobile phone apps are a fine way to get an overview of the trails, but you may want to go old school. 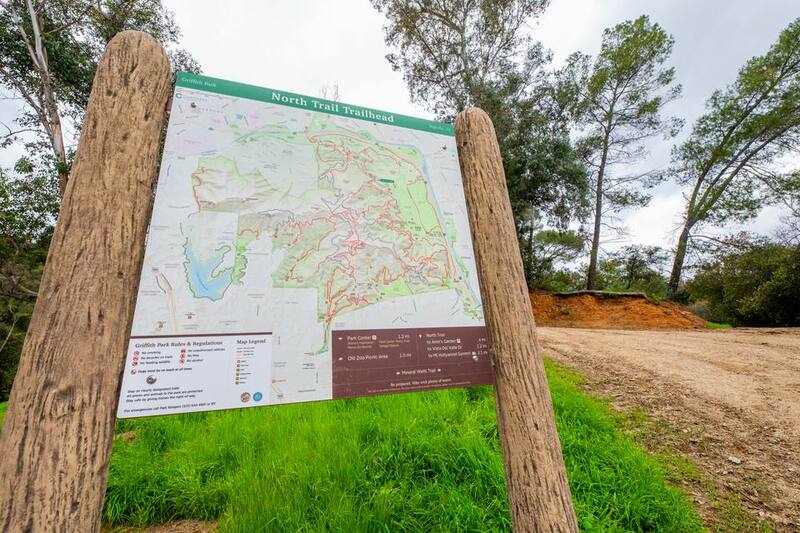 You can get maps of trails and current information on trail closures at the Griffith Park Visitor Center, 4730 Crystal Springs Drive. If you're in good shape, you can get to the observatory by hiking the West Observatory Trail. Get the route here. It's a 2-mile hike with a 580-foot elevation gain, on an easy-to-follow fire road. If you want to try the route but don't fancy a strenuous, uphill hike, think about doing it going downhill instead. Use a ridesharing service or the weekend public bus service that runs from the Vermont/Sunset Metro Red Line station to the Griffith Observatory. On the way down, the Trails Cafe will be a welcome stop and a good place to call your driver to pick you up. Some people say the Old Zoo is one of LA's weirdest (or creepiest) places. It was once the zoo, and what remains of the old animal enclosures make for some of the oddest ruins anywhere. It's also an easy half-mile loop hike that only gains 50 feet, and it's dog-friendly. You can hike there using these directions from Hikespeak. If you're in the mood for a hike through a lush, green environment, this is the one for you. The trail borders a stream that's lined with sycamore trees, which creates a lush, green environment. In fact, you'll find dozens of kinds of ferns flourishing in Ferndell — which makes it obvious how it got its name. The Ferndell hike is a half mile round trip, with 65 feet elevation gain. From the top of the trail, you can walk a short distance to the Trails Cafe for a cup of coffee or a snack. Or you can extend your outing to the bottom of Western Canyon, which will make it 1.75 miles round trip with 260 feet of elevation change. To do this hike, Hikespeak has all the information you need. Amir Dialameh started his Griffith Park garden in 1971 after a major fire in the park, digging with a pick and shovel to carve out a little oasis in the scarred earth. He cared for it for 32 years. Today Amir is gone, but volunteers still care for his creation, and it's one of the most charming picnic spots in all of Los Angeles, with lots of flowering greenery and fantastic city views. The garden is so well known that it has its own Facebook page and more information on its website. The hike starts near the Mineral Wells Picnic Area and is a mile round trip, with 275 feet of elevation change. You can find hiking details at Hikespeak. The Hollywood Sign is technically outside the boundaries of Griffith Park, but the trails through the park don't abruptly end where someone drew a line on a map, and you can get to it from inside the park. You can find a couple of Hollywood Sign hikes in the Hollywood Sign guide. It includes a mostly flat walk around the Hollywood Reservoir that almost anyone could manage. Great Outdoors Los Angeles hosts lots of hiking meet-ups and guided hikes including full moon hikes from the Griffith Observatory. If you're looking for a hike that's also a workout, try these ideas from the LA TImes. Or get maps and reviews of Griffith Park hikes at Modern Hiker. At Yelp, you can see what other hikers think of some of the Griffith Park hikes.